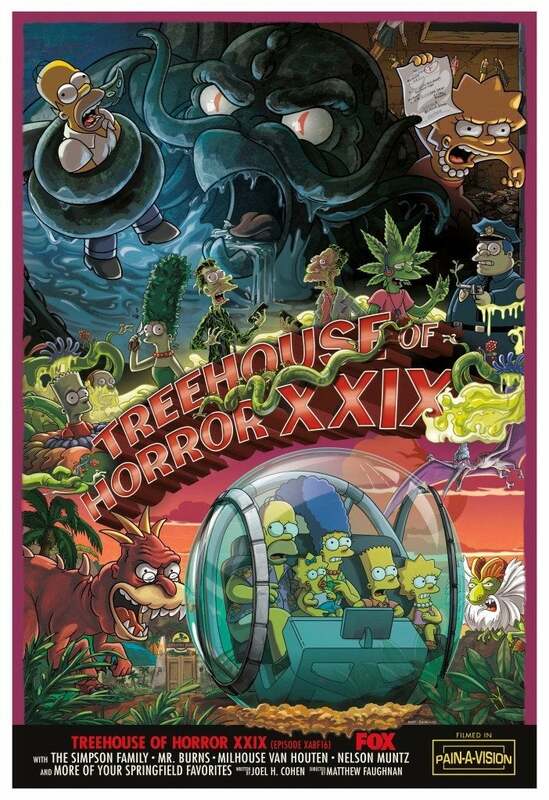 The Simpsons has unveiled its Jurassic World-inspired San Diego Comic-Con poster devoted to Treehouse of Horror XXIX (via IndieWire). The 29th installment of the annual horror-themed episode will spoof Jurassic Park and the modern iteration of the franchise, Jurassic World, alongside segments parodying Invasion of the Body Snatchers and The Three Faces of Eve. FOX has yet to confirm an airdate, but the episode is expected to arrive sometime during the Halloween season. XXIX is scripted by longtime writer-producer Joel H. Cohen, Cohen’s sixth entry in the spooky Treehouse of Horror franchise. San Diego Comic-Con attendees will be able to collect the poster, which sees Grandpa Simpson reimagined as a dinosaur and Simpsons patriarch Homer in the clutches of the mythological Cthulhu. The Simpsons hosts its annual Comic-Con panel Saturday, July 21 at noon, featuring creator Matt Groening, executive producer Al Jean, supervising director Mike Anderson, director David Silverman, and actress Tress MacNeille. Last year, Treehouse of Horror saw famously mute tot Maggie Simpson utter her first words while possessed by a demon and FOX-owned FXX aired a massive marathon celebrating nearly 30 years of the Halloween-themed tradition. Taking place outside of the mainstream Simpsons canon, the Treehouse episodes typically lampoon horror-tinged stories, placing the citizens of Springfield in often supernatural occurrences like a zombie apocalypse, an alien invasion, and a murder mystery. The Simpsons debuts its landmark 30th season Sunday, September at 8 pm on FOX.